Consumer Voice is pleased to announce the 2016 Resident’s Voice Challenge! Residents are encouraged to pick up their pens, dust off their type writers or use a computer to display their writing or artistic skills by submitting essays, poems, artwork, drawings, or videos related to the theme for Residents' Rights Month 2016 "My Vote Matters". Residents are asked to imagine they are running for "Resident President" and their platform is long-term care consumers’ rights. Create a campaign poster or write a stump speech (or record a video of you giving your stump speech). Get a Resident's Voice Activity Toolkit to participate in the activity. 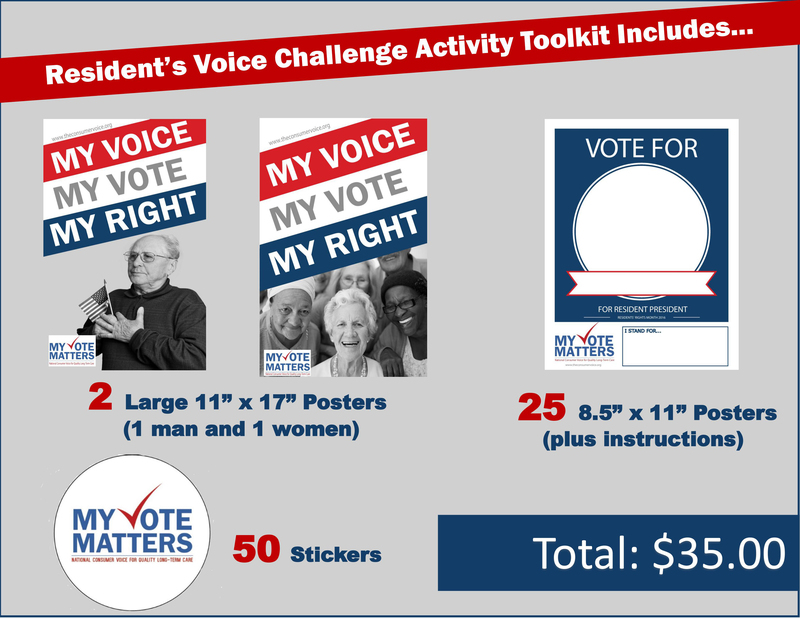 Learn more about the Resident's Voice Challenge here. Get a Resident's Voice Activity Toolkit here.